Revisions help designers monitor corrections on drawings tagging the areas changed. 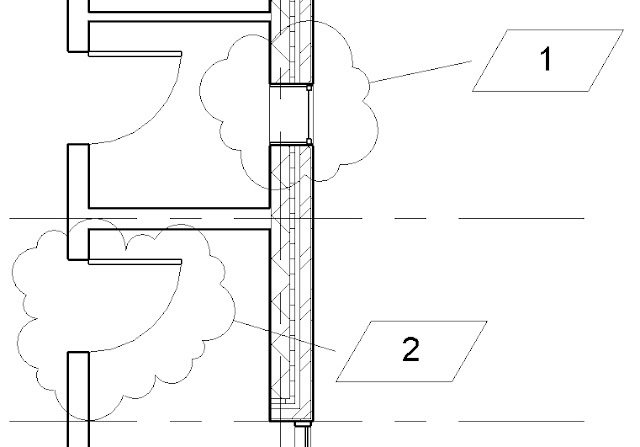 There is a special tool in Revit that allows to make revisions gradually and monitor them while projecting. For sure, every revision can be tagged on the views with “Revision cloud”. 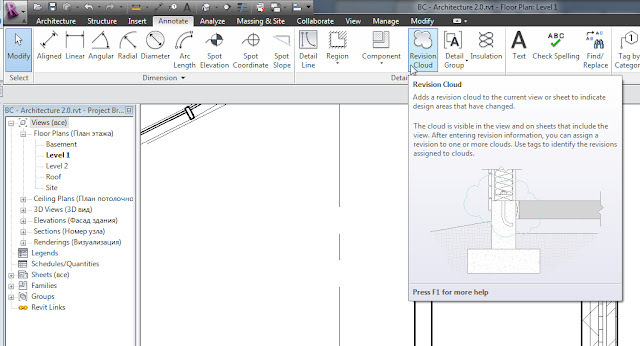 If you tried to add the revision cloud on a plan, perhaps you noticed that Revit adds revisions to #1 only — the program tools provide the fixation of an revision in the schedule and only after that adds a «cloud» on a view. 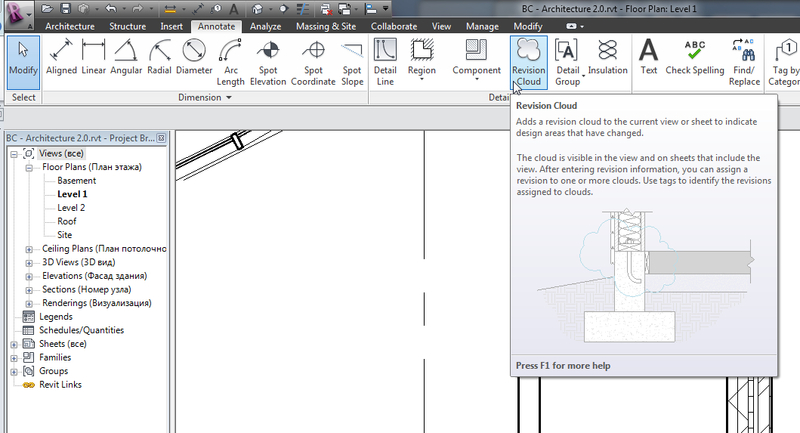 You can perform revisions with the tool Revisions that is situated on View tab (Drawing 2). In this table there is complete information about revisions. (Drawing 3). Description — a field that allows to describe the parts that underwent revisions. For example, "Wall Transition" or "Alteration of the south elevation glass" etc. Issued - allows to fix all the fields except for the revisions view, so the fields cannot be altered. Although, a "tick" can be removed at any time and revision parameters can be modified. Issued to - an individual field to indicate who has demanded the revisions. It is convenient while coordinating various parts of a project. Issued by - similar to the previous column but on the other side — point out those who made revisions. Show - allows to point out whether the cloud and the revision tag will be viewed. These fields are not always enough — for example, for one of the companies it was necessary to point out the person who checked the alteration — as it is impossible to add a shared parameter, we put two last names with the space in-between (example in my post about revision schedule creation in Titleblock). Thus, all the revisions are reflected in this table. The program allows to fill in only the minimum of the fields needed (date and description). The most part of the information added can be reflected in the revision specifications and in the tags. After the revision has been reflected, the views can be tagged. 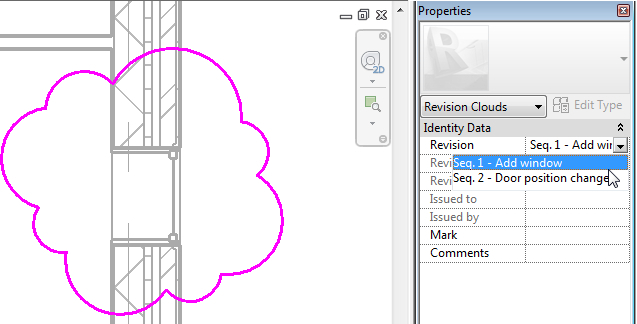 With the tool Revision cloud on the Annotation tab clouds are pointed out in the sketch mode on the drawing (Drawing 5). It is necessary to point out in the properties - to which revision exactly a cloud refers. To do it, select a certain revision in Properties tab in Revision (Drawing 6). To trace the stages of the revisions there is an option to make out a change report. However, in contrast to traditional schedules, it is necessary to edit the titleblock family here. If you used a standard (US) sheet Revit — this schedule is situated on the right. I will tell you in the next article, how to add your own specifications to the list. Now you can effectively use this tool to reflect altered parts of the documentation. P.S. There is one more tool that makes reflection of revisions in documentation easier. 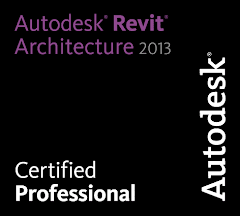 This tool is for Chief Project Engineer/ Architect) - Autodesk Design Review. The product allows to represent all the documents to the client as one file. It includes drawings and 3D models, an opportunity to do the measurements, to do some drawings, and, what is more interesting, it allows to print different list formats in one set. It is easy and helpful in every situation. In case you are interested, post your comments. Can the "Sheet Issues/Revisions" Dialog box be printed on it's own? Need to generate a revision log and it seems silly to go to Excel and recreate what's already been generated in Revit.